Workers, students, unemployed, a wide spectrum of people of Nottingham City and the County including families with their children joined the National Union of Teachers (NUT), Association of Teachers and Lecturers (ATL), University and College Union (UCU) and the Public and Commercial Services Union (PCS) at the Forest Recreation Ground in a large show of solidarity against pension threats, job losses and pay cuts in the public sector. These pension threats are part of the ongoing attack on the wages of workers whether immediate or deferred and the push to make us all work harder and longer to pay for the profit losses of the banks with their market manipulations. A crisis not of our making. All this while the rich are all but unaffected, the banks have been given billions, and corporate interests are taking the piss with massive tax dodges. Amongst a sea of trade union banners, trade unionists, services users and those threatened or already suffering from service cuts marched to Trinity Square. Anti-cuts activists involved with Notts SOS were prominent in the events. Trade union activists then marched to the Albert Hall for an indoor rally and campaign meeting. Speeches in Trinity Square continued to outline the threat to education, the NHS and local services from government policies. At County Hall, Notts Unison members and supporters protested against cuts and axing of vital services supporting people in the County. At the same time as the Albert Hall meeting, after packing up began at Trinity Sq., Notts UnCut visited the usual targets of tax-avoiding companies in the city centre to protest against the hypocrisy of companies like Boots who now have their HQ abroad to avoid tax. All this whilst the Chamber of Commerce of Derby and Notts has the audacity to complain about the loss to UK PLC of one strike day. Especially galling as this was the same day that Lloyds TSB bank said they aim to axe 15,000 more jobs (on top of 27,500 losses already announced) as part of a review to get them back into the black – showing again that it is workers who are paying for the crisis, while it was reported by the Daily Telegraph that “Investors welcomed the results of the review sending Lloyds share price up more than 6pc in early trading to 47.17p”, showing which side private investors are on. Earlier in the morning, from 8am, Notts UnCut and Notts Save Our Services activists, including some individuals from unions not on strike today but supporting the strike action, went round pickets at Job Centres, Courts and the Tax Office handing out sandwiches, cake and chocolate, giving a boost to the official pickets. The night before, other activists reported having superglued the locks to the doors of Job Centre Plus on Canal Street, and also Atos Origin on Stoney Street (who carry out health examinations which are being used to carry out government policy to kick a lot of disability claimants off vital benefits). Elsewhere in the UK, activists made the links between unemployed struggles and the PCS dispute. Some of the high points: It a was a large and passionate march from the Forest and families with children who were missing school due to the teachers’ strike came along to support their school teachers. Royal Mail workers refused to cross picket lines. Workers asked for union application forms on pickets. Lots of honking of horns supporting the pickets and march, including bus drivers. Some of the low points: At one point picket supporters were chased and shouted at by G4S security staff at the Tax Office for going off the right-of-way through the middle of the office grounds in order to find the strikers. Then at Castle College we heard that Teaching Assistants were disgracefully covering lecturers’ classes. Elsewhere some individuals seemed to have fallen for politicians’ rhetoric about pensions and against strike action. But this will not be the end of the strikes and other actions against austerity. In fact action against destruction of the NHS will take place next week on Tuesday 5th (NHS founding anniversary) and a major day of action on Saturday 9th of July. Activity on the 5th will be in North Notts as well as Nottingham. Full details elsewhere on the site or coming soon. The next Notts SOS meeting is on Monday 4th July at the usual venue – YMCA International Community Centre on Mansfield Road, starting 7.30pm. Come and get involved with saving your services! Other reports/photos: http://nottingham.indymedia.org.uk. See also UCU Castle College picket photos on facebook. 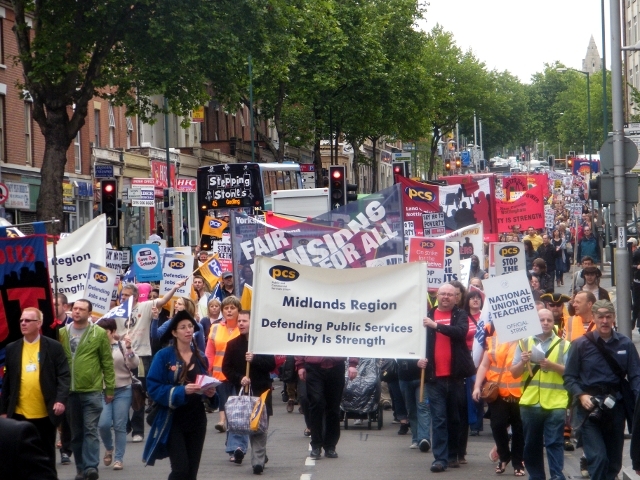 Join the Nottingham unions NUT, ATL, UCU, PCS joint strike march from The Forest and city centre rally at Trinity Square on 30th June, then meeting at Albert Hall with many solidarity actions. Supported by Notts Trades Council, Notts Save Our Services, Nottingham Students Against Fees and Cuts, University of Nottingham UCU Local Association, Notts Uncut, plus Notts Unison action at County Hall West Bridgford against cuts to social care provision in the County. * NO CUTS TO SERVICES! * Bring banners, friends and family! 11.30 am. Marchers leave The Forest, march down Mansfield Road, on to Milton Street and then in to the Trinity Square. Noon/12.30 pm with the arrival of the march in Trinity Square. Speakers, stalls, refreshments and more in Trinity Square. There will be face painting and other activities for younger people. 13.30 pm. March continues along Burton Street, South Sherwood Street and Parliament Street to the Albert Hall on Derby Road for speakers and debate on the way forward for the dispute. There will be live music provided by Banner Theatre, Trade Union speakers and an opportunity to contribute from the floor. Ending 3pm approx. Teachers, lecturers, and civil servants, in the NUT, ATL, UCU, and PCS are being forced to take strike action on 30th June. – make public sector workers pay 50% more for it! – Cut all public sector pay at a time when inflation is above 5% and utility bills will be increased by 19%! This strike action is not happening because union members and their families are greedy; pensions are a vital part of our pay. These union members have chosen to work in the public sector because they believe in providing good public services for all and taking strike action is never an easy decision. The attacks on the public sector are part of a much bigger agenda. The Con-Dems want to privatise the NHS, cut spending on schools and services, price our kids out of college and university, cut benefits to those in need and see unemployment soar. In essence, they want to attack every service that we value and hold dear. Yet none of this is necessary. The richest 1000 people in Britain have seen their wealth increase by £130 BILLION in the last two years to a staggering £396 BILLION. Instead of cutting staff the Government should employ more tax inspectors to get in the £120 billion in avoided, evaded and uncollected tax by the rich, such as the reported £6 BILLION owed by Vodafone. We’re taking action to stand up for pensions and public services for all. Bring your family and join us on the demonstration and rally to show your support for public services and public servants. Unison action at County Hall. Please back demonstration ahead of the Full Council meeting on 30 June. We’ll be protesting from 8.30am (the council meeting starts at 10am). All staff, service users and community groups welcome. Make some noise so your councillors can hear you!!! Adult day care centres forced to close. The council plans to close 35 specialist adult day centres, and replace these with just 13 generic ones. UNISON fears this will leave too few centres, forcing elderly or vulnerable people to travel further. Over 118 care staff face the sack. Supporting People budgets halved.The council also plans to cut £10million of funding to ‘Supporting People’ projects—with many axed or cut as much as 50%. The council under-spent by £24million in the last financial year, but intends to cut frontline services to the most vulnerable and needy. The council claims it has consulted widely on these plans, but UNISON fears these cuts have yet to be fully explained to those most likely to face them. 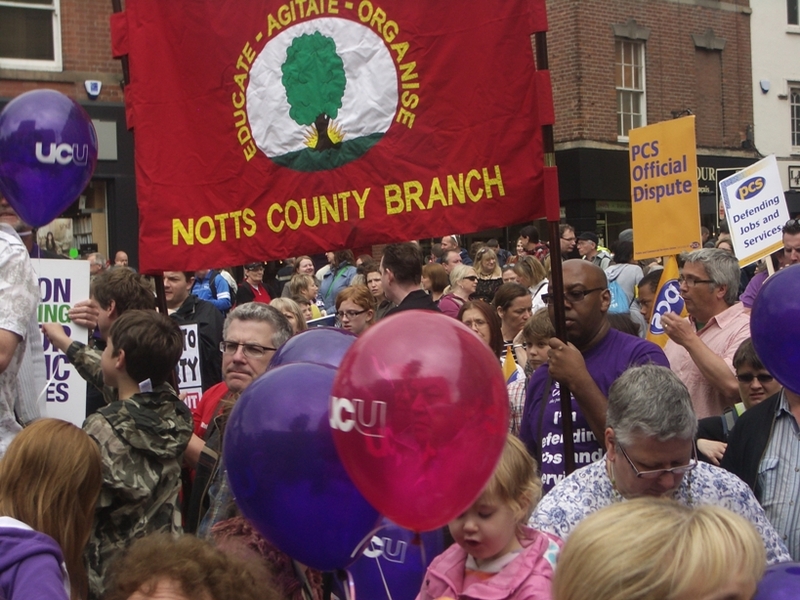 UKUncut support: Notts Uncut will be supporting the June 30th strikes by members of NUT, ATL, UCU and PCS. Nottingham UKUncut will be involved in several activities throughout the day and would love as many people as possible to come along to any or all of them, starting the day by visiting the picket lines and delivering some breakfast to the strikers, meeting at 8am at the front of the railway station. After the pickets have all been fed we will be forming a Notts Uncut bloc on the march. Assemble at the Forest Recreation Ground at 11am and look out for the Notts Uncut banner. If you are able to come along at 8am to feed the pickets can you send us a message to let us know please – everything else, just turn up. University of Nottingham UCU Local Association and Nottingham Students against Fees and Cuts. Those university staff who are able to take the day off (UCU has a seperate pension scheme not controlled by government in which changes have been railroaded by employers) will join at the Forest at 11am and March to Trinity Square. The key message from Nottingham University staff and students is that cuts to university teaching budgets by 80% and enormous rises in student fees will price out students of less wealthy families or leave them with crippling debts. Due to pension changes staff will get a pay cut and worse standard of living in retirement. Government and employers have chosen to make the people pay for the mistakes of the banks. Trade unions are right to defend the terms and conditions of ordinary workers. We urge you to support the actions on 30th June. There has already been a great deal of work done but there is still much to do. Joint union leaflets are being produced and should be available for collection / distribution on Friday 24 June. Your help distributing these leaflets will be invaluable. I have attached an electronic copy for e-distribution, attachment to web sites etc but to order paper copies, please contact paul.williams@dsa.gsi.gov.uk 07771 940812. There will be an opportunities to leaflet in the Market Square, Nottingham from 12.00 and at Long Eaton Carnival, West Park, Wilsthorpe Rd from 12.00. Support at Long Eaton would be especially welcomed. It is hoped that p1cket lines can be advertised on the Trades Council website so please ensure you keep checking for updates. ATL, NUT, PCS and UCU members will be delighted to see you and your members visiting their lines, marching with your flags and banners, celebrating in the Trinity Square and rallying in the Albert Hall so PLEASE publicise these events to your own membership, encourage them to pop along and show your support. We’d be delighted to pass on any messages to members in the participating unions so feel free to send them to this address. If you are free on the day and would like to help out on the day, please let us know. Stewards are always welcome and ‘gophers’ a necessity. Anything you can do would be appreciated. Following successful ballots of the NUT/UCU/ATL/PCS unions, coordinated strike action will take place with support activities in Nottingham during the day of Thursday 30th June. Marches in the city, Market Square demonstration and conference (Albert Hall). Coaches from Notts. Full details forthcoming. of action to save our NHS” on Saturday July 9th. widespread opposition to the government’s Health and Social Care Bill. are still keen to get as many people involved as possible. various activities around the city. to think, meet and act. And to be inspired. For the action planned on the NHS anniversary large banners and placards need to be designed and made. – Materials such as sheets, etc. for banners, poles to hold them up and large pieces of cardboard and paper for placards. – People to design and make these items.